Who would have thought that you'd find a sports enthusiast's haven on the upmarket Kings Road complete with not one but two pool tables. The Trafalgar is one pub where rugby shirts are welcomed rather than outlawed and all the important sports matches are shown on the big screen. Do you work at The Trafalgar? What did you think of The Trafalgar? A good spot to while away the hours in Chelsea. Very friendly, helpful staff (the barman kindly lent me his phone charger), a good selection of beers and an interesting mixture of clientele. I really liked the quirky, mismatched furniture too. I only popped-in to kill some time between meetings yesterday afternoon; they had a special Monday deal running, £10 for a burger and a beer - so I ended up staying for longer. Would happily recommend. Dressed down and demotic by Chelsea standards, this self-consciously quirky pub offers a good drinks range but is let down by indifferent service. Next door to the Chelsea Curzon arthouse cinema and surrounded by boutiques, The Trafalgar enjoys – or maybe struggles with – a location in one of London’s richest and most fashionable areas. After an unlikely spell as a sports pub, it’s now attempting to live up to the plushness of its surroundings by looking, well, rather weird, with an exterior decked out in the violent purple of a pair of 1960s Swinging London bellbottoms. Several more vivid colours feature in an interior design that’s part gastro pub, part soft furnishings catalogue with a timid dash of nostalgic psychedelia – checkerboard tiles, droopy lampshades, exposed girders, ceiling fans, eye-challenging upholstery and silly wallpaper. A single, rather large space is arranged around a central bar, with a cordoned-off restaurant area towards the back. For all the effort to make the place look individual, the standard issue blackboards announcing standard issue deals reveal this is actually a chain pub – in fact part of Mitchell’s and Butler’s “unbranded” Castle chain. That’s not necessarily a bad thing – Castle run some wonderful pubs – but in this case they haven’t quite pulled it off. Aside from a few fast food joints, The Trafalgar is probably the most inclusive establishment in the area and attracts a mixed crowd, from skinny fashionistas and beard-stroking cinéphiles to blokes from the local buildings sites, but they’re a generally youngish bunch. It’s not especially welcoming, though, partly because the self consciously odd design really doesn’t hang together, partly because the rather Wetherspoonish open-plan layout feels uncomfortable, and partly because the staff tend towards the dithering and disengaged. Menus change daily at The Trafalgar, offering upmarket pub grub with a dash of gastro influence. 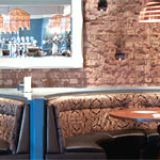 Choices might include sharing boards with cured meats and quails eggs (£15), homemade soup (£5.25), pork and chorizo burgers (£11), toasted couscous, halloumi and avocado salad (£6.50/£9.50), half a roast chicken (£12), sea bass fillets (£13.50) and a few vegetarian main course options like asparagus and crème fraiche tart (£11). Cooked bar snacks (three for £12) include whitebait and baked crusty Brie. Sandwiches are available in the daytime, when you can also take advantage of a fixed price deal on selected cooked dishes (two courses £10, three £13). 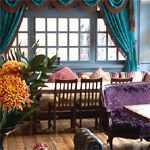 The main attraction, unless you’re a serious fan of bright purple sofas, is the lengthy drinks list – “longer than a Harrods sale queue,” they claim, though that might be stretching it. 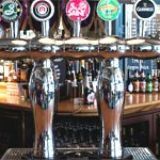 Four real ales include Sharp’s Doom Bar and guests from brewers like Purity and Sambrook’s, and there are several imported speciality keg beers including Bernard from the Czech Republic as well as London choices from Camden Town and Meantime. A handful of worthwhile bottled beers include Negra Modelo and Goose Island Honkers Ale. The 35-strong list of mainly varietal wines is helpfully classified by taste categories and almost half of its entries are sold by the glass (from £4). A few specialist spirits are stocked too, notably rums. Relaxed drinking holes are thin on the ground in Chelsea so The Trafalgar is a welcome enough refuge with decent stuff to drink, but its aesthetic shortcomings would be more forgivable if more oomph and enthusiasm was put into running the place. I don't usually bother writing on these things, however, this evening I had my iPhone stolen from the table by someone pretending to sell a magazine. This person slipped the phone right off the table under my nose under cover of the magazine. Apparently, the pub knows this has been taking place recently and is not doing much of anything to prevent it. Don't leave your phone on a table there, and don't expect much to happen from the people in charge at this pub if it is taken. Not impressed. Won't be going back. Last Monday - Food is OK, tap beer selection is very good, but the evening will be remembered by the HORRIBLE SERVICE WE GOT! We were firstly served by a guy who was clearly new, didn't know anything, but he tried his best and was polite. There was a lady, however, probably a supervisor or manager, who VERY RUDE! With so many bar and restaurants in London, my friends and I will choose another place to hang out. Me and three of my friends went to this pub for lunch on a Friday afternoon and received the most appalling service I've ever experienced. Our order took over an hour on a one hour lunch break. We asked to speak to the manager and he was extremely rude and ended up storming off. I would give zero stars if I was able to!!!!! 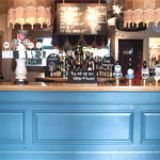 The Trafalgar is a nice pub to have a relaxed drink after work with your colleagues or that is what we thought. I went in there with 10 colleagues last night and encountered the rudest bar man in my 15 years or so of drinking in pubs and bars. We had to wait ages to be served and in the end my friend gave up and went home. The bar wasn't particularly busy but the service was terrible. I pointed this out to the bar man and he told me that I should go home too! We then asked to speak to the manager and we had to wait about 20 minutes and he couldn't have cared less. So if you're looking for a drinking environment where it takes ages to get served and you want to be abused by the bar men, the Trafalgar is the place to go. The Trafalgar is no longer a sporting pub. It has been refurbished and all TVs removed. 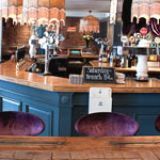 It is a comfortable environment with an extensive wine list and a range of specialist beers. The music is a little too alternative at times and the staff a little lifeless but it's an easy place to drink.